Horror cinema is ripe for the slaughter as Takeshi Murata (Chicago), Darren Banks (United Kingdom), and Jamie Shovlin (United Kingdom) cut, recompose, and manipulate scenes from classic horror films. These works are montages from classic (and not so classic) giallo, slasher, and B-movies from the 1960s-1980s. 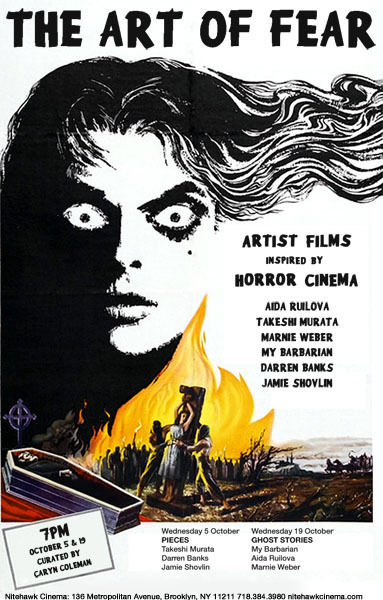 By re-arranging and manipulating the actions and contexts of films such as The Burning, Friday the 13th, and Mask of Satan, these artists apply new meaning to what is familiar in horror. 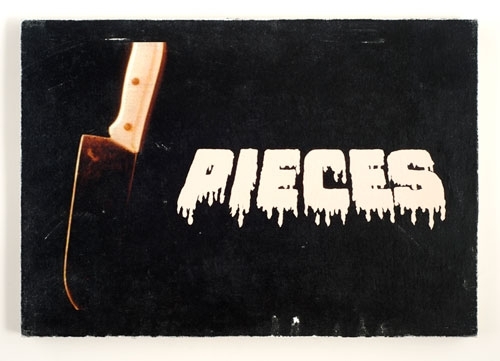 As the first program in The Art of Fear, Pieces is an homage to and de-construction of this influential time period of horror. Read previous GWKTM posts on Jamie Shovlin here and here | Darren Banks here and here. UK artist Jamie Shovlin ongoing installation on Jesus Rinzoli’s 1981 Hiker Meat is the best slasher film never made. 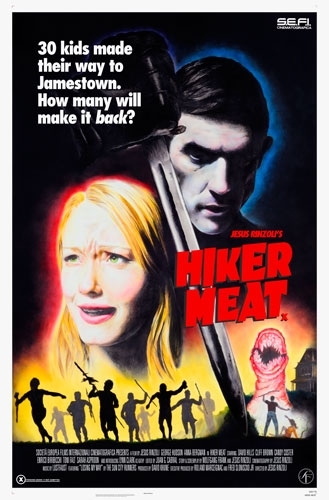 Featuring scripts, posters, drawings, and thousands of culled horror clips, Hiker Meat is a celebration of a memory that didn’t happen except for in our generation’s joint enthusiasm for campy killer classics. Hiker Meat has been shown in various incarnations recently in London at IBID Projects, New York at Horton Gallery, and will be at MACRO this fall. However this Thursday Milton Keynes Gallery will be showing the film’s ‘rough cut’, along with a live performance by Lustfaust, as part of their Scratch Nights series.